Wow Village Cart Escape is another point & click escape game developed by WowEscape. 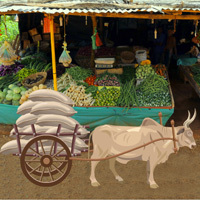 In this game, while carrying your food stuff to a village market, you missed your cart wheel and your bull in that village. You have to find the way to reach the market by finding useful objects, hints and by solving puzzles. Click on the objects to interact with and solve puzzles. Good luck and have fun! I'm still having a problem with going into WOW, G2R and now BIG games, click on an inventory item or a puzzle, and the game jumps around from one scene to another by itself. Upgrading my version of flash fixed the problem for a while, but now it's back. Was able to reload a game once and it worked fine. Now, I've reloaded your games several times and the problem is still there. Tried the games from EG24's link, and the developers' sites, still having the problem. This is only happening with WOW and related developer's games...not with G4K, 8b, selfdefiant games, or any of the other developers. So I'm sure that flash isn't the culprit. If anyone else is having the same problem, please let the dev's know, because they need to fix something. I'd hate to not be able to play any more games from WOW/G2R/BIG because I really like these games. works fine with FF...maybe a flash setting on your comp? Hi SG, sorry you are having problems :( I play through Mozilla, and usually dont have any issues. It is working ok today on Safari. Sometimes I just have to sit and wait til the flashing stuff is over though and then the game plays ok. I am stuck in first set of scenes. How does the domino style grid with the cows work. I need that last grass symbol to move on. Can anyone help? I also need a hint for the ABC 123 puzzle. Jenny- which is more white or yellow? I had to watch the walkthrough. Thanks for trying to help though. the tree/rose thing makes no sense at all. I'm out. Don't miss a tool that is on the floor beside the clay storage pots in a courtyard (I think). for the cows puzzle- for the square where the dots meet- add all white and yellow dots and see which one there are more of. @Sugarcrush, The game jumped around from scene to scene when I played the BEG game today. I refreshed and it worked. This happened before but I had to disable my adblocker on chrome. Tried earlier in Firefox, same problem. Just tried again now in Google Chrome, and the game is working fine. YAY! :) Looks like I'll just have to be more patient with WOW & Co.'s games from now on, lol. You should always play the games from within your browser on this site to avoid the mass of popups and video ads you get on some of these places, particularly WOW and G2R. I have the same loading problems with the mentioned games. Always have to load them 6+ times. Introduction to the game is great and attractive.